Belwin's 21st Century Guitar Method is a complete course that puts lessons in the context of popular styles and classic tunes. It introduces new topics at a progressive speed and uses both music notation and tablature (TAB). 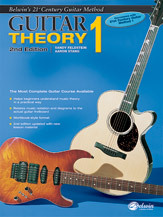 Belwin's 21st Century Guitar Theory 1 correlates with Belwin's 21st Century Guitar Method 1 and helps beginners understand music theory in a practical way. Exercises relate music notation and diagrams to the fretboard to help build students' understanding of the guitar. This edition includes updated new lesson material.